I wasn’t looking to get another dog. 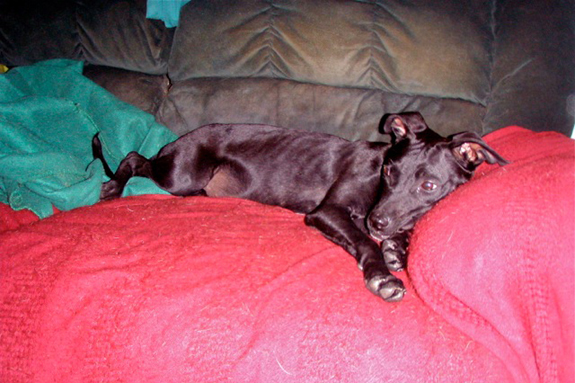 My little red pit mix, Reba, was 13 and two years earlier had lost her big brother, a hound. They had been together for 10 years, and I didn’t think she would accept another companion. Besides, she was perfectly happy being the queen of the house. My friends in animal rescue kept asking me, “Are you ready for another dog?” And I would say, “No … no … no.” And then it happened. I fell in love with a little black dog named Zoey. Every year a group in our community named Animal Network has a festival called Canine Christmas. I’ve been a member of Animal Network since the beginning when we formed to get an off-leash dog park in our county. I work at the festival, registering people for the talent show contest, American Fido. One of our members, Mary, who was forming a new rescue named Safe Haven, was doing public relations for this little black dog near “rescue row” as we called it. Mary is wily. She will say, “Here … hold this dog while I go get a hamburger,” figuring that you will fall in love in the span of 20 minutes. I knew better than to buy into it, so I resisted all day. After the festival, we all sit around telling animal stories and tall tales. The little black dog was wandering among us and came up to me. Uh oh. She wanted in my lap. Uh oh. And I fell for it. She was 9 months old and weighed only 24 pounds, and I picked her up. 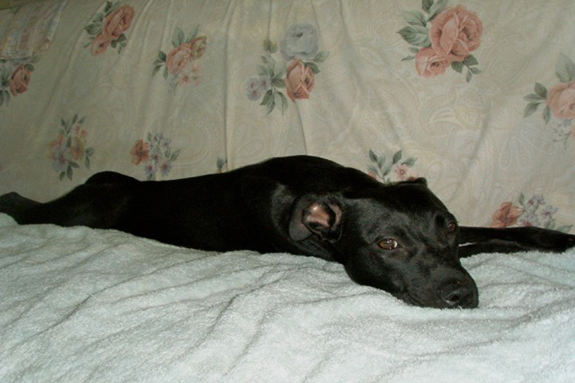 The little black dog had been rescued from a yard where she was tied to a log with no food or water, and she was crying. A woman heard her cries and looked through the fence. She later told me, “The little dog’s eyes said, ‘Help me.’ ” And so she did. 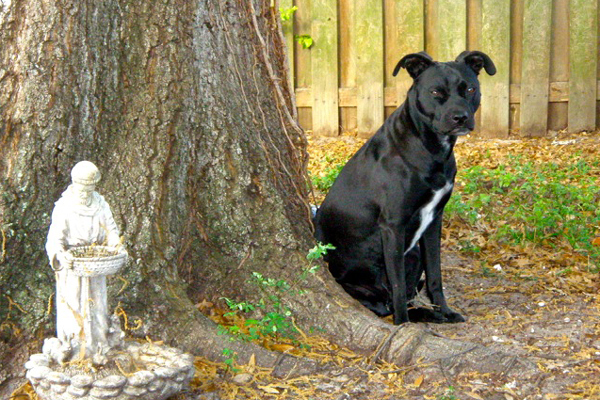 She went into that yard and risked bodily harm to save the little black dog. The “human” who lived there gave excuses why the dog was chained and scarred. But the woman said either she was taking the dog or calling the cops to which he replied, “Take the damn dog.” The woman named her Zoey. When they got to the vet, Zoey had to be given intravenous fluid because she was so dehydrated. The rescue group that the woman had contacted helped with the vet bill, but would not take Zoey because she was a pit bull. So Safe Haven, which was just being formed, stepped in. The president, Mary Lupi, took her into foster where she could be groomed for success. Just two weeks later, Mary brought Zoey to Canine Christmas, where she stole my heart. When I first brought Zoey home, Reba was not overly receptive. She snapped at her a couple times until I sat her down and had a talk with her. I told her this little, starved dog needed a good home, just as Reba had all those years ago after she had been rescued from a life on the streets by some former neighbors. I told Reba that abuse would simply not be tolerated in this house. After that, they slowly began to bond. The first thing I did was give Zoey a new name to celebrate her new life. I name all my dogs after singers. Reba is named for a certain red-haired country singer, and so I was tossing around names of blues singers with my sister, whose last name is Fitzgerald. She suggested Ella, and it was a perfect fit – a lovely name for a beautiful dog. Ella slowly began to heal, to grow and to learn to trust. She would race through the yard, play with her toys, take a nap and start all over again. My heart would swell with pride, and I loved watching her love life. To see a dog who was rescued from a life of abuse becoming happy and healthy is the greatest feeling in the world. Today she is full grown and 42 pounds of love on four paws. Ella loves other animals and all people. There are no strangers for her, only friends she has not met. All she has to do is flash that fabulous pit bull smile, and she has people in the palm of her paw. The next year, I took Ella along to Canine Christmas. The woman who rescued her came to see how she was doing and her daughter walked her and showed her off. All my friends in Animal Network fawned over her. I took Ella up onto the stage and told her story. I spoke to the crowd about what it means to rescue, foster or adopt a dog in need. I showed them a beautiful black pit bull who is sweet and loving, and I hope I changed a few minds that day. Ella goes with me to Animal Network events so people can see what a friendly, well-behaved little girl she is. They can also see that not all pit bull people are dressed in leather and sport tattoos or dress their dogs in heavy metal. They see a middle-aged, professional woman who just so happens to love pit bulls; a woman who has discovered the joys of living with these beautiful, smart, loving, goofy clowns. Next up for Ella is Canine Good Citizen training, and then “graduate school” to become a therapy dog. I want to share her with others, to offer her as an example of how dogs enrich our lives and to show what an awesome dog the pit bull is. And, really, because she’s just too good to keep all to myself. Again tears of JOY for all involved! Ella is a beautiful baby. Bless the woman who saved who rescued Ella. theprettychic Ella is living the life now! She is stunning. Thank god you fell when you did, your life is so much richer for it, and she is paying you back 1000 fold. It’s never a one way street is it? Good luck with the CGC and then on to therapy star. Keep us up to date on how she does. She may be the next super hero! DianaJones ..she is blessed isn’t she….hope she continues on as she will prob be one of the best therapy “spokes dog” for the pitties ever…. 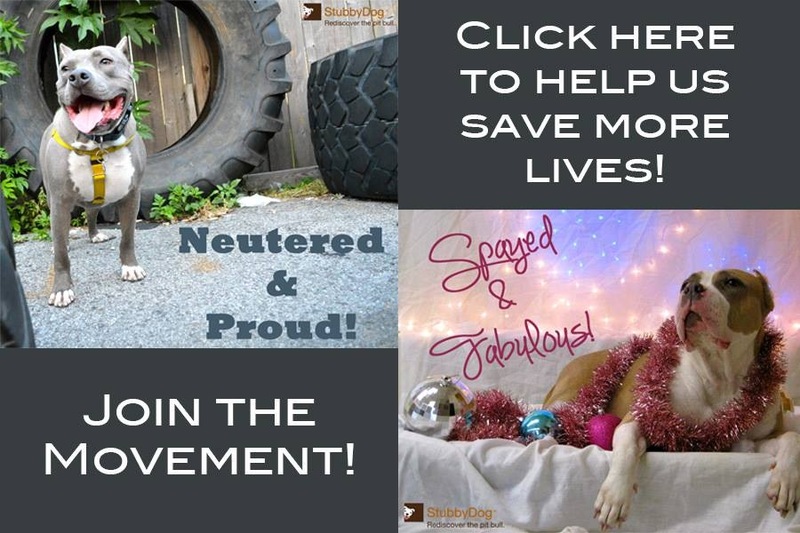 This is another amazing Pit Bull story…. 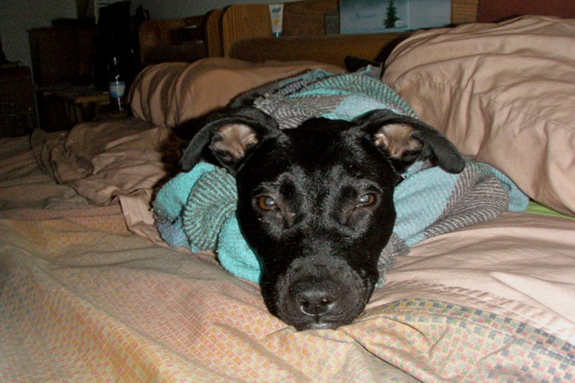 have a Pit Bull, and he is my companion the loyalty, and love between us is beyond words…The story of Ella made me shed some tears…love the ending and God Bless for giving this Pit Bull a chance…..
VirginiaToledo It is just a lovely story and M.K. has informed us that they are going to do more things with Ella as a pit bull ambassador to help change the perception of pit bulls. Great story about courage in Ella’s rescue and open hearts ready and willing to give the needy dog a chance. Thank you for saving Ella and sharing her with the world.